Elibian Nights is a fan-made sequel to Fire Emblem: The Blazing Sword (released as just "Fire Emblem" in the United States and Europe). The game follows the stories of Blazing Sword's cast between the end of that game and the beginning of its sequel, Binding Blade. The game is centered around "tales," which are like your standard Fire Emblem chapter. The main difference, however, is that each tale is completely independent. The cast of the first tale will not carry over into the second, and the stories, while some do link plot points together, each map's respective gameplay is completely independent. After a tale is completed, the player will be transported to the "Tale Select" screen. At this hub, you can select the next tale you wish to play, choose to replay any of the tales you've completed, and view your Achievements. If you're familiar with the XBOX360, you'll recognize the concept of "Achievements." The game features a total of 15 Achievements to unlock! Also included is a hub for "Bonus Content," unlockable extra cutscenes, and the new "Matchmaker" feature, which allows you to modify the default support pairing choices among FE7's characters. "Every tale" is defined as the following: Tale 1 (Eliwood), Tale 1x (Merlinus), Tale 2 (Lyn), Tale 2xa (Rath), Tale 2xb (Kent), Tale 3 (Hector), Tale 4 (Pent), Tale 4x (Douglas), Tale 5 (Raven), Tale 6 (Karel), Tale 7 (Zealot), Tale 8 (Legault), and the Finale (Zephiel). One last hurrah for Igrene's Bonus Tale. What's Arch been up to lately? Also, marveling at the fact that someone created a TVtropes page about my game. But mostly? Procrastinating on FEE3. LOOOOTS of that. Anyways, I'll be posting around here from time to time. Keeping the forest up-to-date and all that jazz. inb4 I get warned for double-posting. Roll the dice. Start an adventure. I actually haven't played this since one of the super early releases here, maybe I'll give it a whirl once I have more time. Oh and I assume you intend for that 2nd post to be for updates, so it's not really an issue. I don't care if hack authors double post in their own thread if there is substance to it. Just edit your author updates into that post or something if you want to make use of it, lol. Ooh, that Western Isles pic has my interest piqued which doesn't happen too often. YAAAY another chance to tear loose with Raven and the Cornwell Crew!!! Heeeey ... I like Elibe. 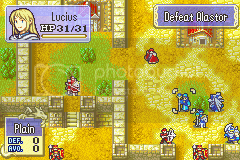 Elibe is fun. It liiiiiiiiives! -downloads- Welp. There goes a good hour of my life. Probably more. -salutes Arch- Well done sir! I've always wanted to try it out, so... *downloads* Looks amazing! We're using Serenes to get more hits for the project with minor updates so I can post the Cafe-exclusive content and get more hits for our site. I mean.... what? Here, get distracted by... this graphical update! Oooh! Aaaah! And all was forgotten. Graphical update? I thought Nino's updated portrait was already shown a long time ago. Oh, then I guess that I'm not really seeing the change. Wait, why did you come back? You never come back! I should probably get around to playing this soon. Damn myself for having less free time in the summer. I'm not going to say much (because who will value MY opinion? :p ) except for "Simply amazing." I'm really looking forward to playing the rest of the tales and earning all of the achievements. 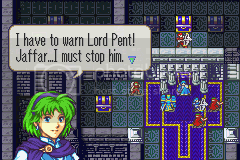 The writing is superb it really feels like after events of fe7. This is really fun as well, the chapters are nice, story is fantastic [i'm sure you've all heard this before] the sprites are cool, the new weapons you all added in are great too.